Kwik-Klik can provide a 2 in 1 Hoarding & Graphics service. As well as planning and configuring your hoarding, we can design, artwork and print bespoke large format graphics and apply them at the same time as the hoarding is installed. 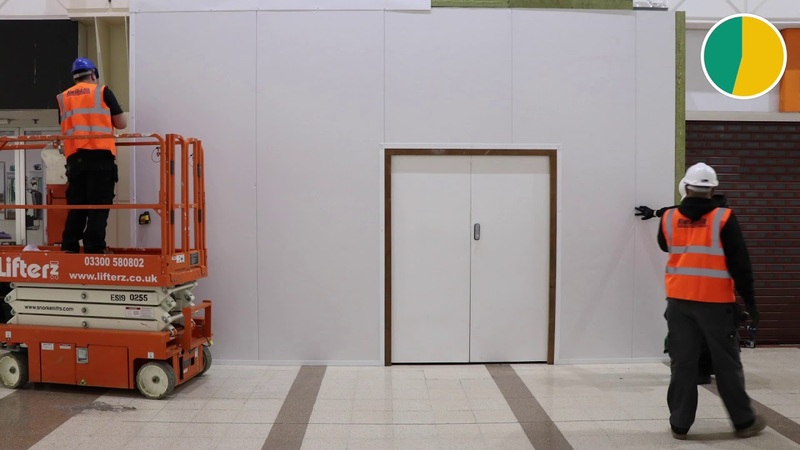 Our seamless service offers you instantly branded hoardings and a pristine, professional appearance with no delays and no waiting for separate trade teams to arrive. Our 2 in 1 installation service will save you time, hassle and money. You can discuss your requirements with our Kwik-Klik hoarding experts and our in-house Dekko Graphics team. We will help you maximise the marketing potential of your hoarding and raise the profile of your project with our cost-effective service. To discuss the bespoke graphics options for your hoardings or partition walls, call Tony at Dekko Graphics now on 01274 392 555. We will always advise you on the best hoarding systems and graphic finishes for the site environment or terrain. Our team has 30 years’ experience working with big brands (including those shown below) at major airports, shopping centres, construction sites, supermarkets, railway stations, department stores and hospitals. We will also tailor the installation to your project’s programme deadlines whenever possible.